choose an option 20 ft. x 20 ft. 20 ft. x 40 ft. 20 ft. x 60 ft. 20 ft. x 80 ft. 20 ft. x 100 ft. 40 ft. x 40 ft. 40 ft. x 60 ft. 40 ft. x 80 ft. 40 ft. x 100 ft. 60 ft. x 60 ft. 60 ft. x 80 ft. 60 ft. x 100 ft. 80 ft. x 80 ft. 80 ft. x 100 ft. 100 ft. x 100 ft. 100 ft. x 200 ft. 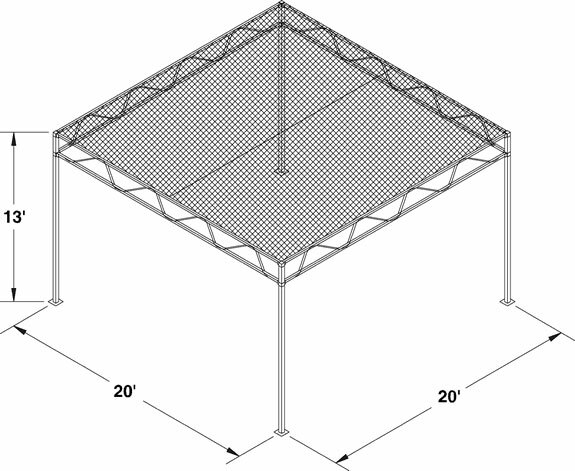 This sturdy shade structure will increase customer comfort and reduce the amount of water used and time spent keeping your live product in top-selling shape. Rugged 3" x 3" galvanized steel vertical posts are combined with a strong horizontal truss system to give you one of the best-built and attractive shade structures on the market. It comes standard in 20' x 20' blocks with 3090% shade cloth and can be customized to fit your exact needs. Anchors with concrete anchor bolts (included). 10" canopy ball bungee every 18"
60% black knitted shade cloth comes standard with every order. Other colors and densities are available upon request. Contact a Sales Representative at 1-888-281-9337 for details.